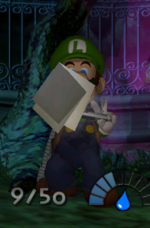 Mario's Letter is an item of Mario that Luigi finds in Luigi's Mansion. It is found inside a little birdhouse in the Courtyard behind the mansion. In the 3DS version's Hidden Mansion, however, it is found in the desk in The Twins' Room. This possession, along with Mario's Glove, Mario's Hat, Mario's Star and Mario's Shoe are scattered around the mansion. If Luigi takes them to Madame Clairvoya, she uses her crystal ball to "communicate" with Mario. When Luigi takes this specific item to Madame Clairvoya, she says: "Wh-what is this? If it isn't Mario's Letter! Give it to me! I will read it at once! Erm... Sure it's OK, I'm a licensed letter-reader! What what? Hm... Let's see... L-o-o-k--o-u-t--f-o-r--B-o-o-s,--L-u-i-g-i-! Is that all? Not a novelist, your Mario. This must have been written in quite a hurry." This page was last edited on December 1, 2018, at 16:36.